Benjamin Franklin is a remarkable man. Raised in humble circumstances, he left home to far surpass his parents’ station in life. He is the epitome of a man who pulled himself up by his boot straps—the quintessential American. Not only was he insatiably curious, but he used it to create useful items, such as a lightening rod, the Franklin stove, and bifocal glasses. His contributions to society went beyond material things to include a library, a university, a fire company, and a philosophical society. Anyone would be proud to have so many accomplishments! Yet, his do not stop there. His most important role was as a founding father of this great country. Interestingly, Franklin wished to remain loyal to England for much of his life. It was not until he spent many years in England working as an ambassador that he realized that the colonies had to declare their independence. He also spent a decade in France securing their assistance during the war and their help in recognizing the country as independent. Along with John Adams and John Jay, he eventually negotiated and secured peace with England. He was involved in the composition of both the Declaration of Independence and the Constitution. He is the Forrest Gump of America’s founding—somehow he is in the middle of all the significant events. The struggles and joys of Franklin’s personal life are also highlighted. While he was primarily loved by a wide circle of people spanning two continents, he had a falling out with his son, a run in with English parliament, and a personal failure running against an opponent. All of these areas humanized Franklin beyond all the fanfare of his community and political persona. The first biography I remember ever reading is Lincoln: A Photobiography by Russell Freedman. I was completely enthralled in it. I did not think much of the writing at the time (it was long, long ago before I really paid attention to such things). I gave more credit to the subject. I mean, who doesn’t find Lincoln fascinating? However, I re-read the book a few years ago. It was then that I realized what a master story teller Freedman is. 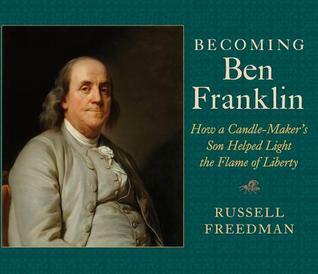 I picked up Becoming Ben Franklin: How a Candle-Maker’s Son Helped Light the Flame of Liberty because it was written by Freedman. I knew he was a “founding father” in a vague sense. I honestly did not know much else about Ben Franklin outside of the kite story and his almanac. I was immediately engage in Freedman’s narrative of Franklin’s life. The story was even more thrilling because his life story parallels the founding of our country. Freedman does a masterful job intertwining Franklin’s personal story with historical events and observations from his contemporaries. The narrative gives a strong sense of his strengths and weaknesses as person. On one hand he was passionate, personable, and persuasive. However, he could also be prideful and resentful. The layout of the book is kid-friendly. Nearly every page has a photograph illustrating a person or event from the narrative. The pictures break up the text, making the pages and chapters less daunting for reluctant readers. Second, the pictures also provide essential visuals for youngsters to get a sense of what life looked like 200 years ago—from the dress, to the wigs, to the quill pens. The book is broken down into short chapters ranging from 9 to 13 pages, each about a different phase in Franklin’s life. This attribute makes it ideal for teachers who want to focus on a specific area and for children who feel more comfortable reading in shorter increments. Overall, I highly recommend Becoming Ben Franklin: How a Candle-Maker’s Son Helped Light the Flame of Liberty for ages 8 and up. The book is sure to engage young and mature readers with its vibrant content and engaging text. Yes, this is a wonderful book. I read it several months ago and was so glad to have found it. Thanks for the reminder.